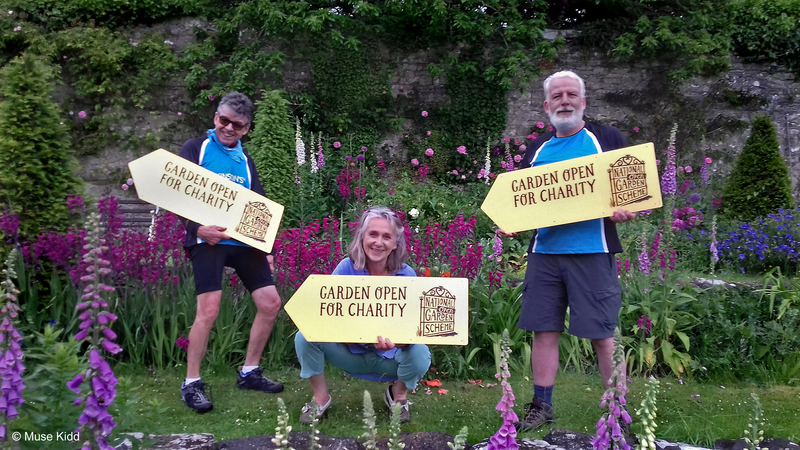 Over the last bank holiday, three teams from Parkinson’s UK cycled to gardens open for charity in England and Wales to the celebrate the 90th Anniversary of the National Garden Scheme. The teams aimed to cycle 90 miles in recognition of the first garden opening in 1927, but with a team in Yorkshire biking 45 miles, another in Cheshire riding 30 miles, and a third in Wales pedalling 40 miles – they smashed their target with an impressive 115 mile total! Parkinson’s UK volunteer Curtis Fields led the Welsh team with two friends from Oakdale. They visited six unique gardens across the county of Glamorgan on Sunday 28 May. The 40 mile challenge started at Pontygwaith Farm near Treharris, and finished at Slade, Southerndown – home of Rosamund Davies, National Garden Scheme County Organiser for Glamorgan. From gardens at farms and cottages to old post offices, the route took the team on a stunning adventure that ended on the coast at Rosamund Davies’ 8 acre garden overlooking the Bristol Channel. Parkinson’s UK first became a guest charity of the National Garden Scheme in 2013, and a permanent beneficiary in 2016. To date, it has received £722,000 in annual donations from the National Garden Scheme. Anyone can visit an open garden, simply by visiting ngs.org.uk to find their nearest garden.